Up until this point in the book, all user interface design tasks have been performed using the Android Studio Designer tool, either in text or design mode. An alternative to writing XML resource files or using Android Studio Designer is to write Java code to directly create, configure and manipulate the view objects that comprise the user interface of an Android activity. Within the context of this chapter, we will explore some of the advantages and disadvantages of writing Java code to create a user interface before describing some of the key concepts such as view properties, layout parameters and rules. Finally, an example project will be created and used to demonstrate some of the typical steps involved in this approach to Android user interface creation. There are a number of key advantages to using XML resource files to design a user interface as opposed to writing Java code. In fact, Google goes to considerable lengths in the Android documentation to extol the virtues of XML resources over Java code. As discussed in the previous chapter, one key advantage to the XML approach includes the ability to use the Android Studio Designer tool, which, itself, generates XML resources. A second advantage is that once an application has been created, changes to user interface screens can be made by simply modifying the XML file, thereby avoiding the necessity to recompile the application. Also, even when hand writing XML layouts, it is possible to get instant feedback on the appearance of the user interface using the preview feature of the Android Studio Designer tool. In order to test the appearance of a Java created user interface the developer will, inevitably, repeatedly cycle through a loop of writing code, compiling and testing in order to complete the design work. In terms of the strengths of the Java coding approach to layout creation, perhaps the most significant advantage that Java has over XML resource files comes into play when dealing with dynamic user interfaces. XML resource files are inherently most useful when defining static layouts, in other words layouts that are unlikely to change significantly from one invocation of an activity to the next. Java code, on the other hand, is ideal for creating user interfaces dynamically at run-time. This is particularly useful in situations where the user interface may appear differently each time the activity executes subject to external factors. A knowledge of working with user interface components in Java code can also be useful when dynamic changes to a static XML resource based layout need to be performed in real-time as the activity is running. Finally, some developers simply prefer to write Java code than to use layout tools and XML, regardless of the advantages offered by the latter approaches. As previously established, the Android SDK includes a toolbox of view classes designed to meet most of the basic user interface design needs. The creation of a view in Java is simply a matter of creating instances of these classes, passing through as an argument a reference to the activity with which that view is to be associated. The first view (typically a container view to which additional child views can be added) is displayed to the user via a call to the setContentView() method of the activity. Additional views may be added to the root view via calls to the object’s addView() method. When working with Java code to manipulate views contained in XML layout resource files, it is necessary to obtain the ID of the view. The same rule holds true for views created in Java. As such, it is necessary to assign an ID to any view for which certain types of access will be required in subsequent Java code. This is achieved via a call to the setId() method of the view object in question. In later code, the ID for a view may be obtained via a subsequent call to the object’s getId() method. Each view class has associated with it a range of properties. These property settings are set directly on the view instances and generally define how the view object will appear or behave. Examples of properties are the text that appears on a Button object, or the background color of a RelativeLayout view. Each view class within the Android SDK has a pre-defined set of methods that allow the user to set and get these property values. The Button class, for example, has a setText() method which can be called from within Java code to set the text displayed on the button to a specific string value. The background color of a RelativeLayout object, on the other hand, can be set with a call to the object’s setBackgroundColor() method. Whilst property settings are internal to view objects and dictate how a view appears and behaves, Layout Parameters are used to control how a view appears relative to its parent view and other sibling views. Layout parameters are not set in quite the same way as properties, but rather stored in a ViewGroup.LayoutParams instance (or a subclass thereof) which is then either passed through as an argument when the view is added to the parent view, or assigned to the child view via a call to the view’s setLayoutParams() method. A LayoutParams object for a view is typically created by declaring how the view should be sized in relation to the parent view (i.e. whether it should fill the parent or be sized to fit the content it needs to display). Once the LayoutParams object exists, additional rules, such as whether the view should be aligned with another view, can be added via calls to the addRule() method of the LayoutParams object. There are subclasses of ViewGroup.LayoutParams for each of the layout types (AbsoluteLayout.LayoutParams, RelativeLayout.LayoutParams and so on). Having covered the theory of user interface creation from within Java code, the remainder of this chapter will work methodically through the creation of an example application with the objective of putting this theory into practice. Launch Android Studio and select the Start a new Android Studio project option from the quick start list in the welcome screen. If any existing projects are already open, close them first using the File -> Close menu option. In the new project configuration dialog, enter JavaLayout into the Application name field and ebookfrenzy.com as the Company Domain setting before clicking on the Next button. On the form factors screen, enable the Phone and Tablet option and set the minimum SDK setting to API 8: Android 2.2 (Froyo). Continue to proceed through the screens, requesting the creation of a blank activity named JavaLayoutActivity with a corresponding layout named activity_java_layout and with the menu resource name set to menu_java_layout. Once the project has been created, the JavaLayoutActivity.java file should automatically load into the editing panel. As we have come to expect, Android Studio has created a template activity and overridden the onCreate() method, providing an ideal location for Java code to be added to create a user interface. 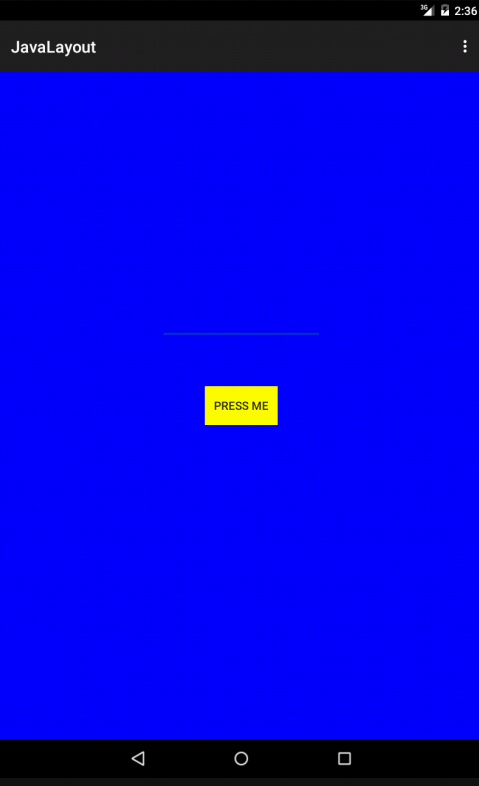 When the application is now compiled and run, the layout will reflect the property settings such that the layout will appear with a blue background and the button will display the assigned text on a yellow background. By default, the RelativeLayout view has placed the button view in the top left corner of the display. In order to instruct the layout view to place the button in a different location, in this case centered both horizontally and vertically, it will be necessary to create a LayoutParams object and initialize it with the appropriate values. Typically, a new LayoutParams instance is created by passing through the height and width values for the view. These values should be set to either MATCH_PARENT, WRAP_CONTENT or specific size values. The MATCH_PARENT setting instructs the parent layout to expand the child view so that it matches the size of the parent. WRAP_CONTENT, on the other hand, instructs the parent to size the child view so that it is only large enough to display any content it may be configured to show to the user. The above code creates a new RelativeLayout LayoutParams object named buttonParams and sets the height and width such that the button will only be large enough to display the “Press Me” text previously configured via the property setting. With both the height and width parameters set to MATCH_PARENT, the button is now sized to match the parent view and consequently fills the entire display. Before continuing, revert the height and width settings to WRAP_CONTENT. A test run of the application should show the EditText field centered above the button with a margin of 80 pixels. As an alternative to writing XML layout resource files or using the Android Studio Designer tool, Android user interfaces may also be dynamically created in Java code. Creating layouts in Java code consists of creating instances of view classes and setting properties on those objects to define required appearance and behavior. How a view is positioned and sized relative to its parent view and any sibling views is defined using layout parameters, which are stored in LayoutParams objects. Once a LayoutParams object has been created and initialized with height and width behavior settings, additional rules may then be added to configure the parameters further. The example activity created in this chapter has, of course, created the same user interface (the change in background color notwithstanding) as that created in the previous chapter using the Graphical Layout tool and XML resources. If nothing else, this chapter should have provided an appreciation of the level to which the Android Studio Designer tool and XML resources shield the developer from many of the complexities of creating Android user interface layouts. There are, however, instances where it makes sense to create a user interface in Java. This approach is most useful, for example, when creating dynamic user interface layouts.